Yoshikazu Mera stands less than 5 feet tall, barely a head higher than the closed lid of the piano next to him. His face appears ensnared in eternal boyhood. His hair is cut in a cuddly Beatle mop. He is wearing a white shirt with puffy sleeves and shoulders, billowing gold lamé pants, platform shoes and a dramatic cape. He is the Hello Kitty of countertenors, men who sing in a woman's range. Mera, 34, is giving a recital in Tokyo Opera City's airy 1,600-seat auditorium, a shoebox-shaped space with a soaring pyramidal, cantilevered ceiling. The wood on the walls feels freshly cut, and the acoustics are lovely. I am surrounded by Mera's fan base of teenage girls and middle-aged women (and the boyfriends and husbands they've dragged along), and nothing makes sense. Mera's singing is stunning. He brings a heart-rending purity of tone, graceful agility, perfect diction and an acute sense of the Baroque style to well-known Bach and Handel arias that open the recital. But once he slips into orange vinyl pants and a tight red-striped shirt, he exchanges wholesomeness for raunchiness. He delivers a Satie cabaret song with a transvestite's gusto. He later impersonates Marlene Dietrich. I've come to Tokyo for its classical music. That is, for its Western classical music. There is more of it here than in any other city in the world. Not only is more going on here than in London or Berlin, but one of the great attractions of over-the-top Tokyo is that it makes everything feel different. Although the typical Tokyo classical concert may be a lot more conventional than was Mera's recital, confusion is nevertheless as much a way of life as is order, and social conformity doesn't seem to interfere with unflappable Tokyoites' acceptance of ostentatious individuality. In the end, a gaudy gender- and genre-bending countertenor fits right in. Tokyo is chock-full of concert halls and, better yet, concert halls full of listeners. I saw barely an empty seat in a week of concert-going during my trip here in November. Where other musical capitals consider themselves lucky to have two or three important large venues for concerts and opera, Tokyo and its outskirts boast 10, plus many more medium- and smaller-sized halls. The city is also home to about a dozen symphony orchestras. Tokyo is a regular touring destination for Europe's and America's most celebrated orchestras, opera companies and soloists. The Berlin and Vienna philharmonics make annual visits. Next month, the Kirov brings its production of Wagner's four-opera "Ring" from St. Petersburg, Russia, with Valery Gergiev conducting. This same production will be in Orange County in the fall and at Lincoln Center after that. But what is a very big deal for Costa Mesa or even New York is business as usual in Tokyo. My week in Tokyo was chosen to fit my schedule. I figured there would be plenty to hear whenever I visited, and there was. On consecutive days in Suntory Hall, one of the city's most prestigious venues, I caught the Czech Philharmonic, the Berlin Philharmonic and the Bavarian Radio Orchestra, the latter two bands being Germany's best. Traveling to Tokyo for Western classical music is, of course, a peculiar enterprise, to the extent that it robs a visitor of opportunities to experience Japanese culture. On my way to suburban Kawasaki to hear a provincial concert performance of "Carmen" by the Tokyo Symphony that featured local singers, I walked longingly past the Kabuki-za Theater. But at least I had the comfort of knowing that classical music in Tokyo inspires its own Kabuki-like devotion that makes concert-going here unique. Moreover, concert-hall-hopping is an excellent way to do the town. Tokyo is a collection of districts. Shinjuku is where you go for "Blade Runner" lights and action and a Manhattan's worth of skyscrapers. Shibuya-ku is where the young shop in delightfully spectacular hordes. The Ginza is for the well-off — designer clothes, fabulous sushi, geishas. Traditional Ueno drips culture and, in spring, cherry blossoms. Ikebukuro is for shopping without the glitz. And in Harajuku, outlandish fashion is on parade. But because Tokyo developed chaotically, every district has something (actually, an overwhelming lot) of everything. There is great food around Shibuya-ku. You can purchase cheap CDs in the Ginza. Each part of town has its music, its concert halls. And what a satisfying experience it is to hear music in Tokyo. Say what you will about the controlled Japanese, one thing they control with an impressive vengeance is coughing during performances. Theater seats tend to be very firm, with little padding and high wood backs, which encourage attentiveness. Audience appreciation is so exceptional that I find it a moving experience just to sit in a Tokyo theater. But concert-going is also a huge challenge in this massive city, and it begins with finding out what's on. There is no way to do it save living in Tokyo, spending time at concerts and reading Japanese. Only about half the concert-hall websites offer an English-language version; of those, some don't list upcoming events more than a month or two ahead. The same is true of the Tokyo orchestra websites. For smaller venues, forget it. That leaves three English-language dailies — the Daily Yomiuri, the Japan Times and the International Herald Tribune — which publish weekly or monthly arts listings on Wednesdays or Thursdays, and the free English-language weekly magazine Metropolis. Even then, the listings are highly selective, barely scraping the surface. I know that because a monthly guide distributed at concerts and available in record stores is the size of a small telephone book. But because it's written in Japanese and it's for the following month, it is of little use to the tourist. More helpful — and also handed out at concerts — are the colorful fliers for events happening in the next several days and weeks. Many of them contain just enough English to make it possible to figure out what is going on, especially if you know your Opus and Köchel numbers and can recognize conductors and soloists by their photographs. You always leave a Tokyo concert hall with more than you came in with. Several Tokyo orchestras have regular series in Suntory (as they do in other halls), but the venue's reputation rests on the many stellar international ensembles and soloists it attracts, plus its acoustics. It was built 20 years ago with excellent acoustics designed by Yasuhisa Toyota, which inspired L.A.'s Walt Disney Concert Hall, another Toyota masterpiece. Like most concert halls in Tokyo, Suntory feels like a refuge. In his "Tokyo: A View of the City," author Donald Richie explains the strong Japanese sense of public and private. The Tokyo street, he writes, is "the ultimate in unrestrained display." The home, on the other hand, enjoys sacrosanct privacy, which begins with taking off one's shoes as a gesture that denotes leaving public space for the private. Although shoes stay on at concerts, the venues, like homes, are frequently constructed away from the street and requiring the concertgoer to walk through a warren of passageways to find the entrance. When you leave, Mozart or Mahler still in your ear, this gracious distance shields you from being thrust immediately into startling traffic. Suntory is part of Ark Hills, a large complex that also includes the luxury ANA Hotel, plus shops, restaurants, residences and business towers. It's not especially handsome, but the amenities are exactly what are needed. If you must, you can grab a sandwich from Subway or a latte from Starbucks. Much better is an inexpensive curry at the counter of funky FISH or surprisingly sophisticated sushi at Kaitenzushi UOKI. Just up the street is Koots Green Tea, with its Starbucks-like green tea concoctions and elegant desserts. The other not uncharacteristic but still remarkable aspect of Suntory is that the hall is commercial — it belongs to the beverage empire. (Yes, that's Suntory Scotch that pays Bill Murray's character $2 million to tout its products in the film "Lost in Translation.") Suntory Hall, its director, Takeshi Hara, told me, "is not a sideline of the company, it is a part of the company." Although when asked whether the hall was expected to make money, he smiled and said that would be very difficult. Suntory isn't the only big business promoting music in Tokyo. The Bunkamura — which contains the large Orchard Hall, along with a small theater for drama (Cocoon), a cinema and a museum — is an annex of the massive Tokyu department store in the heart of bustling Shibuya-ku. In Bunkamura, you can also hit the outstanding art bookstore NADIFF, which also carries a hip collection of CDs. Around the corner from Bunkamura is a six-story Tower Records — said to be the world's largest record store. Its classical fifth floor is legendary. Or at least it used to be when Japan's economy was thriving and before Tower began its own economic downturn. It's still impressive by American standards, but neither it nor the Shinjuku Tower branch (once my favorite record store anywhere) is what it was. Still, the Japanese are fanatical collectors, and Tokyo record stores are treasure chests, particularly of historic reissues. The most impressive I came across was Soft 3, part of the Ishimaru Denki electronics megastore in Akihabara (Tokyo's so-called Electric City). It has several floors of classical CDs, including many classic live performances. The mood in Soft 3 is one of quiet reverence, as though CDs are not so much objects of desire as historic cultural documents deserving deep respect. Such feeling for the past is one of the distinctive aspects of classical music in Tokyo. This is a spectacular city of the moment. Earthquakes, wars and a profound Buddhist/Shintoist appreciation for the transience of all things separate Tokyo from a physical record of its history. Buildings come and go, and no one seems to care. New is generally thought better than old. What is preserved is culture. It is for this reason, and the economic bubble of the '70s and '80s, that Tokyo now has so many new or newish concert halls filled mainly with old music. This is particularly striking at Tokyo Opera City, on the outskirts of Shinjuku. The main hall there is named after Toru Takemitsu, the great Modernist composer who led the way in merging East with West and who died in 1996. Takemitsu was a beloved figure in Japan and an effective champion of new music. Now he has become an institution, but no one has come along to take his place. Standard repertory is the standard almost everywhere. New music does, however, find its way into the programming of some Japanese orchestras. If the new music scene in Tokyo isn't as vibrant as that of, say, the visual arts scene, it does exist. Terry Riley happened to be in Tokyo my first night here, performing in the chapel of the wonderful Jiyu-Gakuen Myonichi-kan, designed by Frank Lloyd Wright as a girls' school. 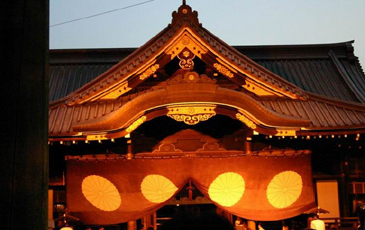 This only surviving Wright structure in Tokyo is now an arts center. A gleefully appreciative audience of young people spilled out of the hall and practically hung from the rafters. Riley performed his personal blend of Minimalism, raga and jazz on the piano, then was joined by Bay Area guitarist David Tanenbaum and, finally, by some Japanese musicians. Curiously, this is one of the oldest concert venues in the city, although it felt utterly modern in spirit. And it helped put Tokyo's more museum-like classical concerts in perspective. THE Tokyo Symphony's "Carmen" was not noteworthy, but the acoustics in MUZA, the modest new Kawasaki hall (a 15-minute train ride from the Ginza), are another Toyota marvel, with sound that felt as though it floated effortlessly on a cushion of air. Thanks to modern technology, anything in this hall is a pleasure to hear. Part of the draw for this "Carmen" is that Tokyo has yet to develop into an operatic capital. The city has a high-tech opera house, the New National Theatre next to Tokyo Opera City (which is not an opera house — go figure), and several companies devoted to Japanese opera, including Nihon Opera Kyokai. But nothing of international stature. Still, the Japanese do have an innate sense of theater and know how to make even something as nonvisual as an organ recital theatrical. A free lunchtime concert in the large hall of Tokyo Metropolitan Art Space in Ikebukuro turned out to be a four-organ recital. That's because this theater has the only four-in-one organ in the world. Like one of those four-color ballpoint pens, it houses Renaissance, Baroque, French Romantic and modern instruments in one casing, which revolves. On my last evening in Tokyo, I heard the Bavarian Radio Orchestra play Tchaikovsky's B-Flat Piano Concerto at Suntory. I have no idea how many times I've heard this hoariest of war horses. My hotel, the Park Hotel Tokyo, was a 10-minute subway ride or an enjoyable two-mile walk from Suntory. I chose it because it provided a remarkable amount of luxury at an average of less than $200 a night and the convenience of being in Shiodome. This new development of skyscrapers is adjacent to the Ginza and next to the Shimbashi station, which allows easy access by train or subway to anywhere in Tokyo. It was late afternoon, and I walked. On my way, I stopped in at the magnificent Zojo-ji Temple and listened in awe to a chanting priest. I took the elevator to the top of Tokyo Tower, an Eiffel Tower imitation, to watch the sun set over the city; Mt. Fuji was barely discernible in the misty distance. All this made overly familiar Tchaikovsky feel somehow foreign again. The pianist was Yefim Bronfman, and he had played with wild, riveting virtuosity. I can't remember having been as energized by this concerto in a very long time. I wasn't alone. It was a great performance that drove the crowd crazy. Was this a case of the old becoming new again? Or an example of a concerto that, like countertenor Yoshikazu Mera, has found the secret of everlasting youth in Tokyo's confusion? It doesn't matter. In the sometimes stilted world of classical music, confusion is a vital sign of life. From LAX, nonstop service to Tokyo is offered on JAL, Singapore, American, ANA, Northwest, Varig and Korean. Restricted round-trip fares begin at $980 until Dec. 28, then drop to $680 until March. To call the numbers below from the U.S., dial 011 (the international dialing code), 81 (country code for Japan), 3 (the city code for Tokyo) and the local number. Park Hotel Tokyo, Tokyo Shiodome Media Tower, 1-7-1 Higashi-Shimbashi, Minato-ku; 6252-1111, http://www.parkhoteltokyo.com . A luxurious and elegant yet moderately priced hotel in the new high-tower development near the Ginza. Many rooms have a spectacular view of Mt. Fuji. Staff is helpful. Try the traditional Japanese breakfast in Hanasansyou, the hotel's excellent Japanese restaurant. The bar offers sumptuous small appetizers, a dazzling view, glorious martinis, sophisticated ambience but only so-so live jazz. Doubles about $200. Conrad Tokyo, 1-9-1 Higashi-Shimbashi, Minato-ku, 6388-8000, http://www.conradhotels.com . A striking new hotel, opened in July, has attracted attention for its dedication to contemporary Japanese art and for its Gordon Ramsay at Conrad Tokyo, the restaurant from London's Michelin-starred celebrity chef. Doubles from about $342. Kaitenzushi UOKI, 1-12-32 Akasaka, Minato-ku, Ark Mori Building 3F; 5575-3555. Surprisingly good sushi from a conveyor belt makes this a good place for a quick bite before or after a concert in Suntory Hall. Sushizen, 1-8-1 Higashi Shinbashi, Minatoku, Dentsu Honsha Building, Caletta Shiodome 46F; 3569-0068. With this new Tokyo branch of one of Japan's most celebrated sushi restaurants, there is no longer any need to go to Sapporo for the freshest Hokaido delicacies. Fish is flown in daily, and the new restaurant on the 46th floor of a tower next to the one that houses the Park Hotel has the further advantage of spectacular views of the Imperial Palace. FISH, 1-12-32 Akasaka, Minato-ku, Ark Mori Building, 3F; 5562-4305. Fast, inexpensive but substantial, spicy Indian-Japanese curry on large, steaming plates is a great bargain in this fancy shopping center across the plaza from Suntory Hall. It is also vegetarian friendly. Koots Green Tea, 3-1-1 Roppongi, Minato-ku (has other locations as well); 5545-3778 . A green-tea chain that puts Starbucks to shame. Pleasant small plates, with tofu specialties, are especially recommended, as is the delicate green tea cheesecake. Jiyu-Gakuen Myonichi-kan Auditorium, 2-31-3 Nishi-Ikebukuro, Toshima-ku; 3971-7535, http://www.jiyu.jp/index-e.html . Tokyo Metropolitan Art Space, 1-8-1 Nishi Ikebukuro, Toshima-ku; 5391-2111, http://www.geigeki.jp/english . Suntory Hall, 1-13-1 Akasaka, Minato-ku; 3584-9999, http://www.suntory.co.jp/suntoryhall/english . Tokyo Opera City, 3-20-2 Nishi-Shinjuku, Shinjuku-ku; 5353-0789, or, for tickets, 5353-9999, http://www.operacity.jp/en/concert . MUZA Kawasaki Symphony Hall, 1310 Omiya-cho, Saiwai-ku, Kawasaki City; (do not dial 3 before this number) 44-520-0100, http://www.kawasaki-sym-hall.jp/index_e.shtml . The Daily Yomiuri, http://www.yomiuri.co.jp/dy ; the Japan Times, http://www.japantimes.co.jp ; International Herald Tribune, http://www.iht.com/pages/asia/index.php ; and Metropolis, http://www.metropolis.japantoday.com , are widely available in Tokyo. Japanese-language lessons can be streamed from http://www.nhk.or.jp/lesson . They can also be downloaded at http://www.hickorytech.net/nic111 . Japan National Tourist Organization, (213) 623-1952, www.jnto.go.jp.